Having grown up in the Church, I’ve seen both the best of what a life of faith can bring (love and forgiveness, hope and healing, purpose) and the worst of what Bad Religion can produce (guilt, suspicion, pride, paranoia, divisiveness, hate). It’s taken me a lifetime to sort out what is true faith in Christ, and what is the nonsense and man-made garbage that get’s added to the mix. Sorting through the two, with the help of scripture and the Holy Spirit, is sort of like picking the lint out of the dryer vent. The nonsense clogs the witness of God’s people, and thankfully the Lord and His plan is bigger than all the sand we humans can throw into the engine. Even at our brightest, we are a dim bulb in shining the light of God’s grace to a hurting world. And yet, mysteriously, He keeps on using us to further the Kingdom of Heaven here on earth. Jesus chose twelve disciples who were tremendously flawed individuals. Peter was impulsive and impetuous, quick to speak and act without thinking (“I’ll never betray you Lord!”). Thomas was prone to doubt, even if the evidence was right in front of him. James and John argued and fought for position in the ranks of Jesus’ followers (he called them the “sons of thunder” for all their brotherly arguing). And Judas? His financial swindling and conniving went farther than he ever thought it would (a good thing to remember when you are tempted to think of any sins as “little”), and he ended up selling out the Son of God for thirty pieces of silver (which many scholars attribute to about $4,000 dollars in today’s economy). How is it that these disciples (minus Judas, who’s guilt led him to take his own life) and other followers of that day spread the gospel in such a way that the powerful Roman empire and the very world of that day was turned upside down in just a few hundred years (with echoes reaching our shores today, nearly 2,000 years after that event)? A jar of clay (or “earthen vessel” in the good King James) was a disposable thing in the ancient world, the equivalent of a plastic water bottle or a Styrofoam take-out box from the burger joint down the street. It was something to use a few times, and when it broke, you just fashioned another one. It was a weak, toss-off kind of thing, and Paul’s using of it as a metaphor would have hit home in the ancient world. You don’t put a treasure in a Dixie Cup, you put it in a locked safe or vault. Yet the Lord, mysteriously, chooses to use fallible people (like your’s truly) to show the world the Kingdom of God; what a life lived in communion with the living creator can look like. But the great “why” applies here. What is God thinking? Why choose to use frail, fragile things to house his Holy Spirit? What net benefit does this bring? What sort of master plan is this? And really, that’s the core of Bad Religion. When our frail selves try and trumpet how good and righteous we are, the cracks start to show, and the harder we attempt to cover them up. This goes south real fast, and metastasizes into something vile and rotten. Ever wonder how so-called Christians went from being burned at the stake in the days of the early church to burning so-called heathens at the stake themselves hundreds of years later? Well, here’s your formula. Take a little self-righteousness (“I really know what’s best”, ‘I‘m better than that guy“) and let it ferment for a bit, and over time, you get a recipe for a dangerous, grotesque shadow of faith that does a lot of damage in the name of the Lord. But if we rightly see ourselves as He does, as frail forms that He chooses to use, fragile things full of cracks, but filled with His power, then the real work of love can begin. Any good thing that we do gets rightly attributed to the power of God working inside us. The light shows brightly through the cracks. You can easily crush a Styrofoam cup full of water, but you cannot crush one with a frozen block of water inside. It’s not the cup that has become suddenly powerful, but what is inside it that gives it its newfound durability. 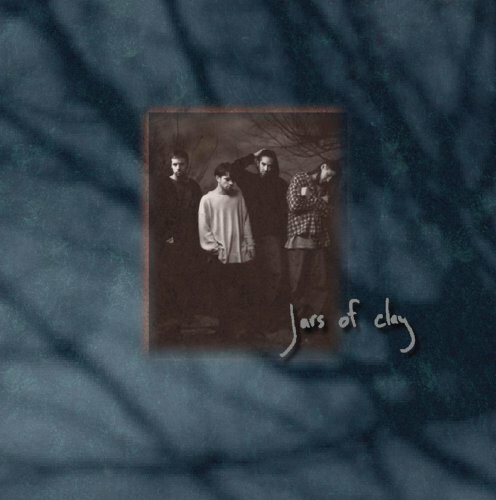 The band Jars Of Clay helped bring this critical, spiritual metaphor to light for me. And at a time I was battling and questioning the forms of Bad Religion all around me, they helped me see the forest for the trees. I was in the right place at the right time to hear their debut album (a good couple of months before the rest of the world) when I happened upon the guys at a music festival in my youth group days. They were not playing the fest, but they were there as fans of other bands. I’m not sure if they were supposed to be doing this, but they handed out their album freely, and, truth be told, I almost didn’t take it, because it seemed like they were just another small-time artist trying to get their name out. (Another youth group member proclaimed the guys “lame” for trying to promote themselves this way.) But I was never one to turn down anything free, and the album cover looked cool, so I grabbed one. Are you dying for nothing? He wasn't broken for nothing. I still struggle with Bad Religion (election years tend to bring out the worst qualities here), and the damage it has done to many in this world (including members of my own family that want nothing to do with the faith), but it comforts me to know that Jesus struggled with Bad Religion too (it was self-righteous religious leaders who killed him in the “name of God“), but he still showed how God loves the world and wants to bring every one who would come, back into fellowship with Him. Jesus pushed through all of this to show love in the most vivid way he could, by giving his life up for mine (and yours). This is “the one thing that I know”. And it keeps me going. This Sunday is Easter, and my church will be full to the rafters with both regular attendees and all of the other folks who wander in once or twice a year. I’m playing in the band this week (that’s me jumping around with the bass guitar), and from my perch on stage, just left of the drum kit, I’ll get to see folks who’ve battled Bad Religion, who’ve been scarred by it, and by life in general. And together with my fellow worship team members and pastoral staff, get a chance to articulate what it is truly all about. Christ’s resurrection, that same power that rose him from the grave, lives in me (another wise, Holy-spirit inspired nugget from St. Paul), and gives me hope. This power to love, to speak boldly, to hope, is housed in this fragile body, this “jar of clay”, giving me purpose and energy for tomorrow. This is “the one thing that I know”. Happy Easter to you, and may we all shine His light through the cracks in our earthen vessels.